The top jobs were those you probably expect. Last year, many of those involved in this “off-hours profession” made far more than any surgeon, physician or psychiatrist I’ve ever met. And they did it on their own terms. Like David Michaels. He’s an executive at a firm that sells batteries, hardware, auto care products and more. All day long this gentleman meets with clients, goes over budgets, you name it. No doubt his job is very high-stress. And in a little over 12 months, he’s brought in $161,585 of passive income. Making these particular moves required no advertising. No keeping up websites. No boss. Bruce Blanow from Florida is another example. He graduated from the University of Massachusetts back in 1980. And since then, he’s had a very successful traditional career. Over the past year or so he’s used it to log paydays totaling about $39K per month. The money these people collected through their off-hours profession was in addition to their regular jobs. No doubt their actual jobs took years of study, hard work and sacrifice. For that they receive regular salaries and bonuses like the rest of us. But while working, they’ve also found this way to increase their income outside of the office. Or a huge time commitment. As I said, this is passive income. But that doesn’t mean just anyone can do it. This isn’t some bogus “make money from your computer at home” sort of deal. It’s not the sort of thing a “former employee of Walmart” or fast food worker found to make a fortune. Those schemes are just plain nonsense. Rather, this is a PROVEN way to bring home thousands of dollars in easy income each month. It takes some smarts… skill… and a bit of gumption, too. So if you’re an intelligent person who can follow a few simple steps, I know you can do this. There’s no doubt in my mind that you could make as much as $7,783 per month from it this year… all in your free time. That’s an extra $93,394 – in just one year – to do whatever you want with! In fact, it’s not even technically a job. In fact, so far in 2015, you could have collected paychecks ranging from $4,192 on April 29… to $8,462 on June 22… to $16,190 on July 6… to even as much as $78,696 on January 5. 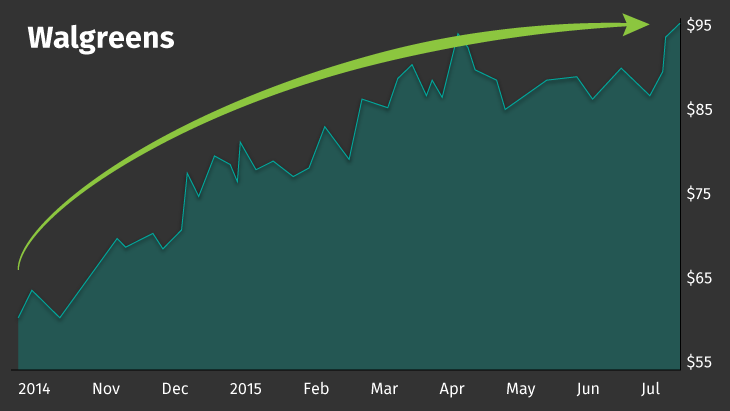 The average on our winning plays comes out to $7,783 per month. So what would you do if you actually received a paycheck this Friday of $7,783? Would you pay off your debt? Take an exotic vacation? Buy the car of your dreams? Gift it to your children or your grandchildren? Or maybe you’d simply put the money back to work… to collect bigger and bigger paydays so in the future, you could achieve an even grander goal. To create your own personal six-figure income – on the side. And remember – this DOES NOT require starting some new business… participating in a crazy online marketing scheme… or anything like that. Still, I’ll be the first to admit that piggybacking the off-hours profession in the way I’m about to share with you is NOT for everybody. It’s pretty simple – this isn’t for you. Then you are exactly the type of person I believe could benefit from the off-hours profession. Now I realize you’ve seen claims like this before. I see them daily as well. In message boards… on Facebook… you’ll always see these insane postings about making $9,462 per hour on your computer. The problem with those deals is… most of them lead you to gimmicks like filling out online surveys for $2 an hour. Many others are downright fraudulent. The profession I’m talking about today is very real. And it’s one practiced by some of the wealthiest and most intelligent people in America. From July 22, 2015 to July 29, 2015 – in just one week – John Kingston used this off-hours gig and was up a cool $24,329. I’m telling you: Everything they are doing is simple and straightforward to follow. And there is A LOT of money to be made here. You’ll need to track certain money movements in the stock market and then follow the instructions regarding where to collect. These money movements are so obvious and predictable… once you know what to look for. I’ll show you this secret in full over the next few minutes – as well as all three steps. My name is George Rayburn. I’m the Director of Business Operations at The Oxford Club, one of the world’s most powerful publishers and fellowships of private wealth seekers. For more than 25 years, we’ve dedicated ourselves to helping people just like you accumulate wealth – quickly and safely. And we’re proud of the results our team has been able to deliver. And one of my personal favorites, Richard Collins from South Carolina, who recently wrote in to tell us he has almost achieved his seven-figure goal. In fact, in about three years his net worth has gone from $520,434 to an incredible $888,326. Now, I’m not reaching out to you today to simply brag about the money our readers have made. Rather, I want to help you start writing your own personal success story. You see, short of winning the lottery, I’ve never seen an easier or more foolproof way to accumulate wealth than by piggybacking the off-hours profession I’m going to tell you about now. Until I saw it for myself, I had always assumed – like most people – that if you wanted to bring home six figures a year, you had to get educated and work your tail off. That is, until one gentleman shared with me THE EXACT THING I’m about to share with you. The passive income secret I’m about to show you started as an extra source of cash for some of the wealthiest people in the world. CNBC credits it with making people millions. The Oxford Club’s Chief Investment Strategist Alexander Green has perfected a way for everyday people like you and me to benefit from this profession. It’s a way to collect thousands of dollars in passive income – month after month – by taking advantage of a strategy used by Wall Street’s highest-level executives. To understand what I’m talking about, you have to realize that the wealthiest Americans do not simply collect a salary. They find lots of ways to generate extra passive income. And they’ve made a lot of money buying – and selling – their company’s stock. There is a perfectly legal way for these insiders to trade. In fact, thousands of shares are bought and sold weekly by corporate insiders. And these insiders rake in gobs of money on perfectly legal “insider” trades. This is what I refer to as their off hours-profession. As much as an extra $7,783 worth of passive income every month – sometimes more. As you probably realize, the CEOs and CFOs of the world have access to every bit of company information you could ever want. Each day, they’re on conference calls talking about new products… they’re looking at sales reports… they’re working out the deals on mergers and acquisitions. They know when the company is targeting new markets… and when it’s beaten out a competitor. And they know it before anyone else. Put simply, they have an edge. And that edge allows them to collect large paydays of extra income by acting on information that is NOT available to the public. It’s this “side job” – using their inside information to make stock trades – that’s made them millions. And how you can easily follow their lead – starting today – to score your own huge paydays. Walgreens is a perfect example. And not for the best of reasons. In early August, the company decided NOT to shift its headquarters overseas to escape high U.S. federal and state corporate taxes. The stock sold off 15% on the news. And then to make matters worse, the former CFO Wade Miquelon filed a defamation suit against the company claiming that he was unfairly blamed for the error. 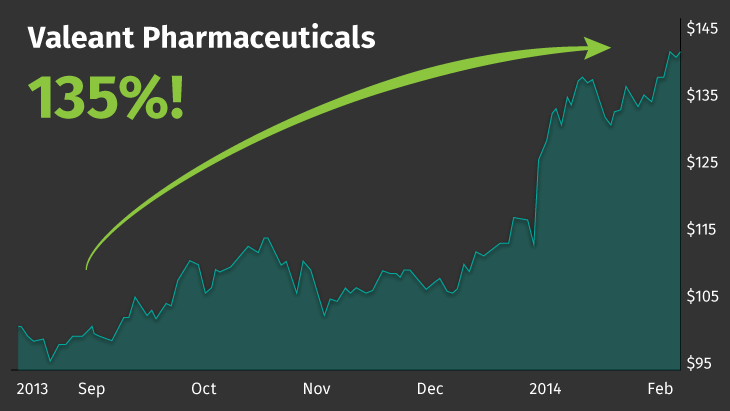 Now, as a regular investor… with so much bad news making headlines… you’d probably stay far away from Walgreens. And that’s what most people did. But the insiders did something wholly different… Director Barry Rosenstein actually took this opportunity to start buying… and buying a lot! In October 2014 he purchased 1,250,000 shares of Walgreens for around $77.3 million. Perhaps he had a feeling that the company’s merger with Alliance Boots would give it just the boost it needed. Now, I can’t promise you’ll make $41 million. But if you had purchased just 1,000 shares when Rosenstein bought his 1.25 million shares, you could have collected $32,800 in passive income for yourself. And I promise you, I can show you exactly how to tap into these market-crushing returns. Let’s look at another example, Valeant Pharmaceuticals. Based in California, Valeant specializes in both branded and over-the-counter drugs. Back in August 2013, a flurry of buying activity began amongst the insiders. Director Ronald Farmer purchased 2,500 shares – an investment of $250,000. Chief Legal Officer Robert Chai-Onn bought 5,000 shares for $500,000. And not to be outdone, Director Fred Hassan picked up 51,000 shares – an investment of more than $5 million. Why were they buying en masse? Well, for one, they were in the beginning stages of several acquisitions of profitable drug and healthcare companies in Asia and Latin America. Sales were way up as well… jumping 34% in one year and topping $1 billion. So the insiders, understanding that good news was about to come out, began piling into the stock. Now remember… these folks have access to all kinds of material, nonpublic information about the company’s financial health and near-term earnings prospects. And their buying activity clearly indicated that Valeant – though at the high end of its range – was undervalued. As you’ve already guessed, they were right. And that $5 million investment made by Director Fred Hassan? It’s shot up 135% and is now worth $12,074,250. Now, if you had bought just 100 shares alongside these guys, you could have collected passive income totaling $13,500. That’s how this works. You figure out when the insiders are loading up and you tag along for the ride. Now, I’m sure you’ve enjoyed a hearty meal at this homestyle restaurant at least once or twice. But there’s more to this place than just good meals, fair prices and comfortable atmosphere. And Sardar Biglari, beneficial owner of Cracker Barrel, knows it. He owns more than 3.7 million shares – and in April 2012 he invested almost $10 million more into the stock. Clearly, he KNEW business at Cracker Barrel would remain strong… and he was dead on. Today, the 178,890 shares that he purchased in April 2012 are worth upward of $28 million. One more time trusting Sardar Biglari’s instincts (and insider moves) and you could have had the opportunity to pocket an extra $18,700 in Cracker Barrel – if you purchased just 100 shares. 1. Company insiders get access to nonpublic information. 2. They buy up stock in their company (legally). 3. The company’s stock soars – and the insiders profit big. In fact, study after study proves that companies experiencing legal insider buying greatly outperform the market. There is a way for regular investors – just like you and me – to make quite an income from following the insiders’ moves. And they use this intelligence to both grow AND protect their money – no matter what the market is doing – before you and I have any clue what’s going on. Thanks to a little-known loophole. With just a few stipulations. Here’s the big one: Insiders must alert the SEC regarding any moves by filling out what’s called a Form 4. And then the trade becomes public knowledge – giving regular traders like you and me the chance to profit alongside them. This is the off-hours profession I’m talking about. By tracking the insiders’ moves… and tagging along for the inevitable upside move… you can collect thousands of dollars each week. And here’s what’s even better: There are dozens of opportunities to follow insiders… every week. And this three-step system I’ve been telling you about is the most reliable way of doing it. The key is watching the insiders closely and making sure you get in right after they act, before their nonpublic information gets out. On May 14, 2013, William Rastetter, a director at Receptos Inc., made a big purchase of his company’s stock. Now, at the time, it was trading for only $14. 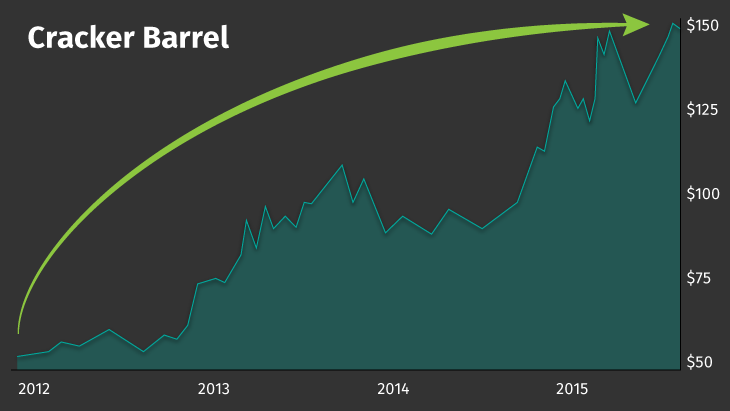 But less than one year later, by March 12, 2014, it was up to $53.10 a share. If you had put in $10,000 at the same time as Mr. Rastetter, you would have collected $27,928 in passive income. Better yet, if you had held on to it, today that one $10,000 investment would be worth $164,342. On December 31, 2013, CEO of Desert Gateway Inc. Martin Shkreli picked up $1.05 million worth of his company’s stock. At the time, it was trading around $7. Just four months later, the stock had jumped to $23.36. If you had put just $10,000 into this stock around the same time as the company’s CEO, you would have wound up with a profit of $23,371. That’s a gain of 233%! The same story played out in United Insurance Holdings Corp.
Back in August 2013, Director William Hood was buying up tons of shares of this company. He got in at around $7.50. Once again, if you had followed him and invested just $10,000, you would have made $27,453. The side profession I’m talking about really is this simple. And it works in three steps. And third, you sell and collect your passive income. The payouts from this can be life-altering, to say the least. In the three examples I just gave you, an investment of $10,000 in each would have helped you score $78,752 worth of extra income. It has to do with a system set up by our Chief Investment Strategist Alexander Green. He’s created a way for Oxford Club Members to identify and profit from the discreet moves of Wall Street insiders. And depending on how many of Alex’s trades you follow, you could end up with dozens of paydays – every year. Question #1: How does Alex track the insiders? As I said earlier, corporate insiders are required to file a statement with the SEC within 48 hours of buying their stock. You can see all of them at the SEC’s Edgar database. Question #2: With so many filings, how do you know which ones to follow? This is where you need a seasoned veteran like Alexander Green. The fact is, many of those 2,800 daily filings are worthless. If the purchase is tiny – like $500 – you can throw that out. It’s meaningless. If it’s an insider sale, you don’t want to bother with that either. Insiders sell for all kinds of reasons. And scheduled purchases or sales don’t carry much weight either. What you want to see are high-level executives making BIG unexpected purchases. Hundreds of thousands of dollars is good. If they are betting millions, even better. People don’t risk that much money lightly. It means they probably know something we don’t. What’s even better, according to Alex, is when you see lots of insiders all buying at the same company. That means they all see the writing on the wall. Sales are big. The company is doing well. The stock is about to blast off. And they all want in on the action. Novavax Inc. is a great example. Just this year, at least seven executives and major holders all started making purchases at the same time. CFO Barclay Phillips picked up over 8,000 shares… CEO and President Stanley Erck picked up more than 6,000 shares… and the senior vice president of manufacturing picked up 9,000-plus shares. It was an insider feeding frenzy. And sure enough, from January 31, 2015, to August 11, 2015, the stock has exploded 509% – jumping from $2.28 to $13.89. Question #3: Just how successful is Alex at tracking these? What’s his verified track record? Well, when Alex first started on Wall Street, he had one goal. He wanted to find an “edge” – that special something that would separate him from all the other guys. So he devoted himself to learning everything he could about the markets. He started reading books night and day, tirelessly studying the words handed down by Warren Buffett and his teacher Benjamin Graham. He pored over Peter Lynch’s One Up on Wall Street until he understood every word. So over time, he developed his own strategy for investing in companies with huge insider buying. He found a way to access the SEC’s insider buying reports the moment they were filed. And he began using those reports to pick his stocks. Alex first started making his insider recommendations in a service called The Insider Alert back in 2003. Over the past 10 years alone he’s closed out 474 positions. And he’s averaged a 33.81%return on each (including partial plays). Let me emphasize that again. Over 10 years, he’s recommended and closed positions following insiders on 474 occasions. 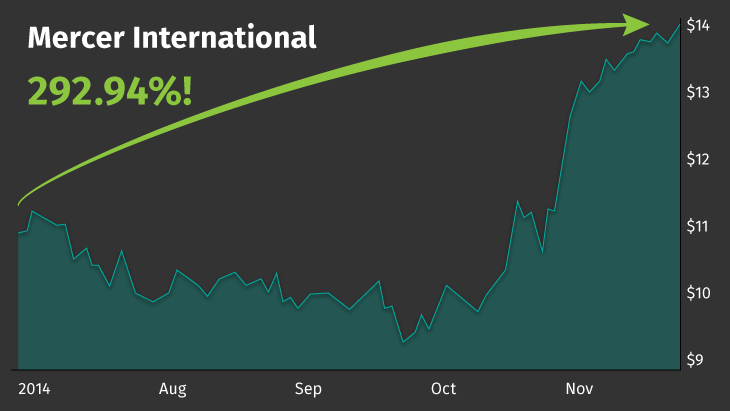 And the average gain was 33.81% (including partial plays). Remember those three plays I told you about earlier? Well, those were just three real instances where Alex was able to identify opportunities to help people get the chance to capture a ton of passive income just by following the insiders. Following the insiders’ moves, Alex went on to recommend those companies in real time to his subscribers. The question you need to ask yourself is… what would a 33% gain once every six months mean for your portfolio? If you started with a $10,000 investment and collected a 33% gain just once every six months for 10 years, today you’d have collected $2.99 million in passive income. An investment of more than $3 million. Now at the time, if you had taken a look at the company’s most recent numbers, you wouldn’t have been impressed. And the company had just lost $0.09 a share. But savvy insiders like Kellogg were looking forward – not back. That’s because they knew that earnings were expected to hit $0.50 a share that year and more than double in 2015. And those following him in this off-hours profession were able to turn an investment of just $10,000 into a quick payday of $29,294. We Followed Billionaire Investor Carl Icahn to the Bank! 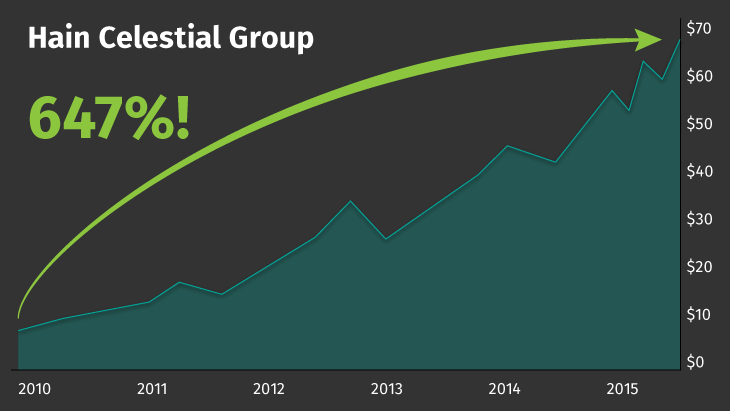 Back in January 2011, Carl Icahn was loading up on a natural and organic food company called The Hain Celestial Group. He saw that the stock was selling cheap – and so he invested $1.46 million in the stock. Soon thereafter, the company announced strong earnings and the plan for two strategic acquisitions – as Icahn undoubtedly expected – and the stock shot up. 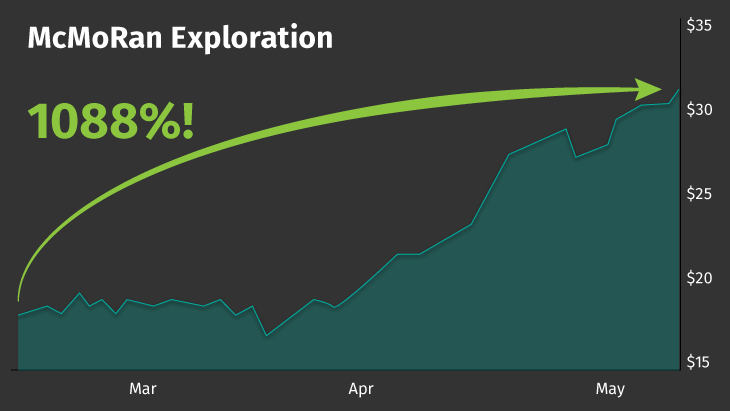 Those who took Alex’s advice on this leveraged play had the chance to turn a $10,000 investment into a payday of $48,000 in less than four months. And that you can do in your spare time. This one also came from tracking the moves of billionaire investor Carl Icahn. It happened back in May 2012. And noticed that Mr. Icahn suddenly picked up $19 million worth of a company called CVR Energy. The company was about to get some fantastic news. Alex suspected that the company was about to sell for a premium on its current price. So on May 29, 2012, he helped a handful of people follow Icahn’s trade. Shortly after, Icahn announced that he had contacted 30 buyers for CVR. 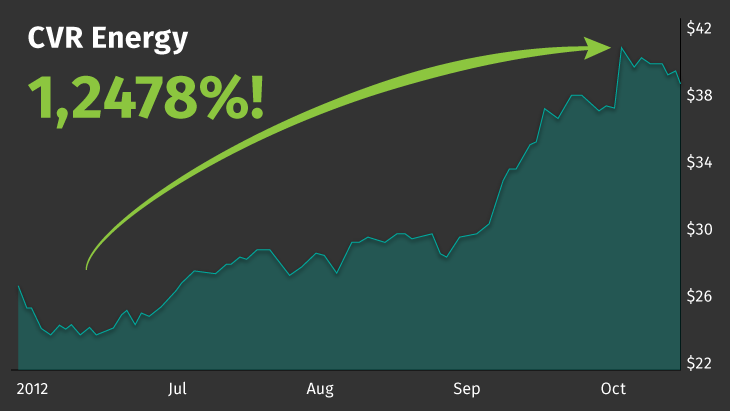 And in just four months, Alex’s recommendation on the leveraged play shot up an extraordinary 1,248%. Assuming you invested $10,000 into that play, you would have made an incredible $124,800 in passive income. The accuracy of this strategy is extraordinary, as I’m sure you can see. As I stated earlier, over the past 10 years he’s closed out 474 positions with an average return of 33.81% on each. Giving you the chance to score a monthly passive income of $7,783… or more. Where does that number come from, you might ask? The $7,783 figure is what you would have made in just over a year had you invested $10,000 in all of Alex’s winning plays. And the three simple steps you can follow – starting today – to help create your own personal six-figure side income. But if you follow these six rules, I’m telling you, the size and frequency of your paydays will increase dramatically. #1: Look Only at Insider Buying, NOT Selling:Insiders sell for all kinds of reasons. It might be part of their compensation package. Or maybe they need the money to pay taxes. Or for a down payment on a new house. However, insiders buy for only one reason. And that’s to make money. #2: Significant Buying: Remember, these guys are usually very rich (and smart). If they only buy $5,000 worth of a company’s stock, it means almost nothing. We want to look for six-figure, or better yet, seven-figure purchases. People don’t risk that kind of money unless they are pretty sure of how it’s going to pan out. #3: Successful Track Records: Not all insiders have the same “batting average,” if you will. That’s why it’s important to look at the track record of each insider we follow. Have their investments paid off in the past? If so, their transactions carry more weight. #5: Insider Buying When Prices Are High: This one seems unusual. And it’s rare that insiders do actually buy when the stock price is already high. However, every once in a while insiders still load up. That means the internal reports they are seeing are SO good, the high price doesn’t scare them. And it almost always leads to even bigger stock increases. You can expect even better paydays when this happens. #6: Individuals Who Own More Than 10% Are Key:There are certain management firms, individuals and hedge funds that, because of their large stock position, can gain exclusive access (and influence) to corporate management. Any purchases made by this group must be taken very seriously. Youdon’t actually have to worry about them. And all you need to do is follow him – and his VIP research service called The Insider Alert. Today, Alex is opening up his service to 250 individuals who are interested in following insider movements for big gains. The price you should sell the stock for the biggest payday. This is invaluable information that takes Alex hours every day to research. And you’ll get access to all of it in just a matter of seconds. That gives you an extreme edge. It also allows you the opportunity to collect the biggest possible gains in the shortest amount of time. Now, I should tell you… this does not boil down to simply copycatting every insider move out there. There are a few criteria that help Alex separate the biggest winners from the losers. Once he finds a company where multiple insiders are buying, he runs the play through a set of criteria that greatly increases his win rate. Institutional support from mutual funds and other large traders. The list totals 25 unique criteria. When he finds a company that passes his rigorous test, he will send you all the details immediately. To Alex, it’s all about giving regular everyday people like you and me the same advantage as the world’s wealthiest. His alerts are designed to only take up about 15 minutes of your entire week. In each one, he’ll give you his clear and concise analysis. Then if you choose to follow along, you’ll simply make your move, then leave the trade alone… potentially collecting thousands of dollars while you go about your day. I know a lot of people keep saying that this bull market we’re in has to end soon. Alex’s strategy for following the insiders works in a down market, too! I hate to bring back bad memories, but think back to 2008 for a moment, if you will. The stock market plummeted. It lost nearly 40% within mere months. And many people saw their portfolios and retirement accounts completely devastated. However, while most were losing money, those following Alex’s recommendations from The Insider Alert were making money. By following the insiders, they were able to see where the smart money was going. For example, in February 2008, Alex noticed insiders were buying up massive amounts of shares in McMoRan Exploration, an oil and gas exploration company. Right before the stock market fell, company Director Robert Day purchased $8 million worth of McMoRan shares. Alex ran the company through each of his metrics and it passed. So he immediately sent out a “Buy” alert on February 19, 2008 – in the midst of the market meltdown – to his Insider Alert followers. And while the market continued its free fall, Alex’s followers were still able to gain an extraordinary 1,088% on his recommended leveraged play. That’s enough to turn a simple investment of $5,000 into $54,500 worth of passive income. The fact of the matter is this: No matter what’s going on in the market, there are always individual companies that will do well. He saw that McMoRan had healthy cash flow, double-digit earnings per share and a high margin of safety – all positive factors from his 25 metrics. Most importantly, though, he saw that the people running the company were buying shares – and lots of them. And this wasn’t just a one-off. Alex’s research has helped his readers beat market lows time and time again. And we’re confident that when the bull market does end, those following Alex’s Insider Alert will still have the chance to make plenty of money. Right now, Alex is looking into several insider situations that look very promising. For instance, he’s found a hot tech company that insiders just poured $2.7 million into. And a growing pharmaceutical company where five separate insiders just bought a total of 11,463 shares at $2.28 a pop. And then there’s the company leading the green energy initiative that has three insiders who just went on a buying frenzy. Alex is going to run these situations through his 25 criteria and if they met them, then he’ll send immediate “Buy” notices when it’s time to get in. He’ll tell you exactly how to maximize your gains… when you should buy… and for how much. And of course, when the time comes, he’ll tell you when to collect several thousand in passive income. To help get you started right away, Alex has agreed to do something quite rare. You see, every day Alex scours insider buying records looking for the very best opportunities to share with his Insider Alert readers. However, due to the nature of his strategy, he’s only able to share his large cap finds. It would be too risky to recommend any small cap plays to all of his followers. But there are a few profit-packed opportunities that Alex is looking at right now that he believes are just too good to waste. And he’d like to send the details of those to the first 250 people who join his service today. These three opportunities alone could help you score your first monthly paycheck of $7,783. The global Internet media company that three insiders just dumped millions into. That includes the company’s director who picked up 200,000 shares and one 10% owner who just invested about $2.18 million. The clinical-stage biopharmaceutical company where two of the company’s directors just picked up more than 500,000 shares each for about $1.38 million. You’ll receive your copy – including all the specifics of when to buy – in your email the moment you subscribe to The Insider Alert. Alex is allowing the first 250 people who respond to his invitation today to try out his Insider Alert service for a full 90 days. Then, over the next month, take the time to track Alex’s performance. 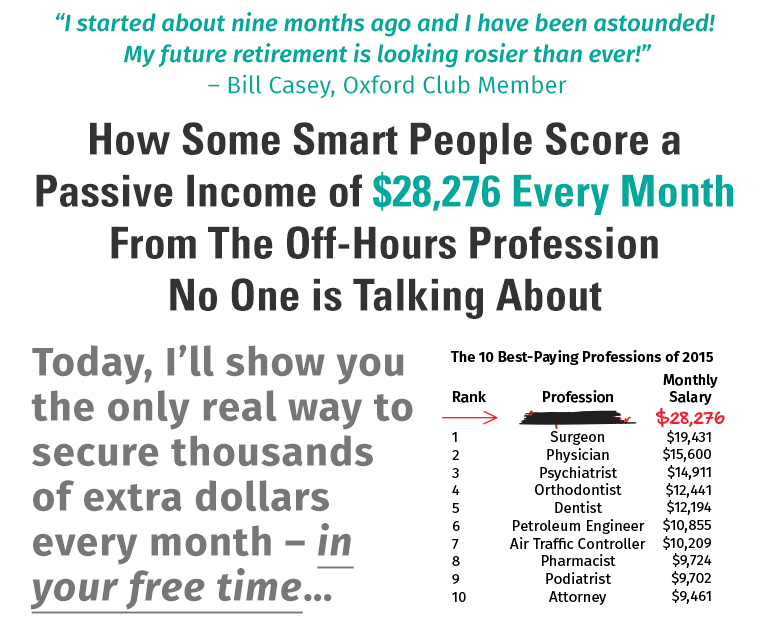 See for yourself just how profitable following this off-hours profession can be. Do it all on paper so there’s no risk to you. And when you’re ready… once you’ve seen it work for yourself… jump on in and start collecting your own income on the side. If you are unsatisfied at any time during your first 90 days, you can cancel and get your money back. The only cost will be our 10% processing fee. We charge this fee because, believe it or not, some people like to sign up, receive our work for 89 days, and then quit… only to sign up a few days later and do it all over again. We added the fee to protect against this sort of scam. But either way, the pressure is on us to deliver a great service. You can get started right now and review all the details on the subscription form by clicking on the button below. After you join, we’ll immediately send you a welcome letter that explains everything you need to know to begin. It’s very important to Alex that you’re prepared to be as successful as possible using his strategy. That’s why he’s been working hard alongside our team to develop a special “toolkit” for his newest Insider Alert subscribers. In it, you’ll find Alex’s Quick-Start Guide to help you jump right into everything The Insider Alert has to offer. This guide is complete with details on exactly how much you should invest… specifics on how Alex’s alerts work… and a walkthrough of Alex’s entry and exit strategy. In addition, he’s also included a complimentary hard copy of one of his most-recommended books for getting a deeper understanding of the nuances and opportunities in the stock market: How to Make Money in Stocks by William J. O’Neil. This national best-selling book contains proven techniques for finding winning stocks before they make big price gains… tips on picking the best stocks, mutual funds and ETFs to maximize your gains… strategies to help you avoid the 21 most common investor mistakes… and much more. And I want you to know: This Welcome Kit – and all of the tools inside – are yours to keep, even if you decide that Alex’s service isn’t for you. Because regardless of your goal – whether it’s to supplement your income, grow your retirement portfolio, or just enjoy some extra spending cash – there’s no question in my mind that Alex’s service and these tools he’s put together for you can help you get there. We want to extend an invitation for you to join today and save 65% on the retail price of Alex’s service. Go ahead and page through his recent issues… read the complimentary book he’s included in your Welcome Kit… memorize his Quick-Start Guide… enjoy your limited-edition 1-ounce silver coin. And if FOR ANY REASON you are not completely satisfied, just let us know. We’ll give you a full refund (less our 10% processing fee) at any time during the first 90 days you’re with us. This is hands down one of the best offers Alex has ever authorized for those interested in trying his Insider Alert service. And it’s an amazing deal. But he’s also guaranteeing that you’ll love the results! This special package is something Alex has never done before for his Insider Alert service and I can’t say for sure if he’ll ever do it again. And keep this in mind: We are only accepting 250 new subscribers today – and I expect we’ll fill up pretty quickly. Alex is so confident in his service that he wants to make it as easy as possible for everyone listening today to try it out. And don’t waste your time trying to follow the insiders on your own – without Alex’s proven strategy – just to save a few bucks. It’s time to take control of your bottom line. And Alex can help you do that. Simply click the button below to get started right away. Clicking the link doesn’t commit you to anything – it simply gives you the opportunity to see the never-before-offered 65% discount Alex is offering you today. Please take a moment to review everything. I’m certain you’ll agree this could be the key to helping you achieve all of your financial goals. This special offer is only available for a limited time – and I’d hate to see you miss out on Alex’s next big winner.